“Value” – specially how we create and communicate it – is probably the hottest issue in legal pricing at the moment. So how much would you pay to find out how Microsoft’s legal team measure value? If you’re smart – nothing. Instead you will listen in to the ‘Business of Law Podcast‘ where Karen Kepler (Law Procurement Manager at Cargill) talks with Rebecca Benavides (Director of Legal Business at Microsoft Corporation) and Jason Barnwell (Assistant General Counsel of Legal Business, Operations, and Strategy at Microsoft Corporation) about the process of designing and building an outside counsel panel. And after you have listened to the podcast (around 40 minutes of your time), download the show notes and take a look at the 4 page slide pack on ‘CELA Law Firm Engagement: Strategic Partner Selection Process‘ – because you’ll then be able to recognise where the image at the top of this post comes from. Big lesson learnt here: Our clients want to talk to us about this, but are we really willing to listen? Today (28 December 2018), Lawyers Weekly in Australia published an article by Lachlan McKnight, CEO of LegalVision in which Lachlan comments on his ‘Observations on NewLaw in Australia in 2018‘. At the outset I should state that I don’t know Lachlan, and this post is no way directed at him, but is just a numbered-point muse on the interesting observations he makes in his article. ‘NewLaw’ (which is as meaningless a term as ‘Mid-tier’) is now an ‘industry’ – now that’s interesting. Agree with Lachlan’s comment in #1. While I agree with Lachlan’s comments in #2, I also believe the attitude here is changing within the more ProgressiveLaw firms. ProgressiveLaw firms realise that with greater risk (which fixed fees actually are), there should be a premium (much as there is with any insurance premium). EvolutionaryLaw firms go one step further and start to have a conversation about ‘value’ pricing. Three is an interesting comment: aren’t LegalVision in part owned by G&T – as an aside (re #3 above), didn’t Danny Gilbert recently state that he thinks that clients don’t want move away from the #BillableHour?. Nevertheless, I agree with a lot of what Lachlan says in #3 but would probably set the bar at $75 million (we still only have a population of 25 million and IBISWorld still only puts the WHOLE legal industry revenue in Australia at $20bn [NB: the top 30 law firms in Australia make over $50m a year – in an industry this small!]). I would totally disagree with Lachlan’s comments in 4 and in my opinion you only need to look at the stuff MinterEllison and KWM are doing (with whom I have no association) to see this point – to me – is misplaced. In fact I would go 180 and say many BigLaw firms are going through their Arthur Andersen/Accenture moment (the original ‘child eat parent’?). The biggest challenge NewLaw (and Mid-tier law if such a thing exists) has to #5 isn’t OldLaw, it’s the #Big4. Number 6 is a point I have tried raising several times this year – scale. Law (Old and New) see ‘scale’ as being bodies (in part because of time-based billing). If it ever was it not longer is and any law firm, new or old, that get’s the right answer to scale will have a point of difference and in such a competitive market this is crucial. The reality is that potentially the biggest winners here should be the so-called Mid-tier (who have a lot of the grey haired industry knowledge without, currently, the scale – but I fear they have missed the boat because of lack of investment). For #7, see my comment in #3 re G&T. 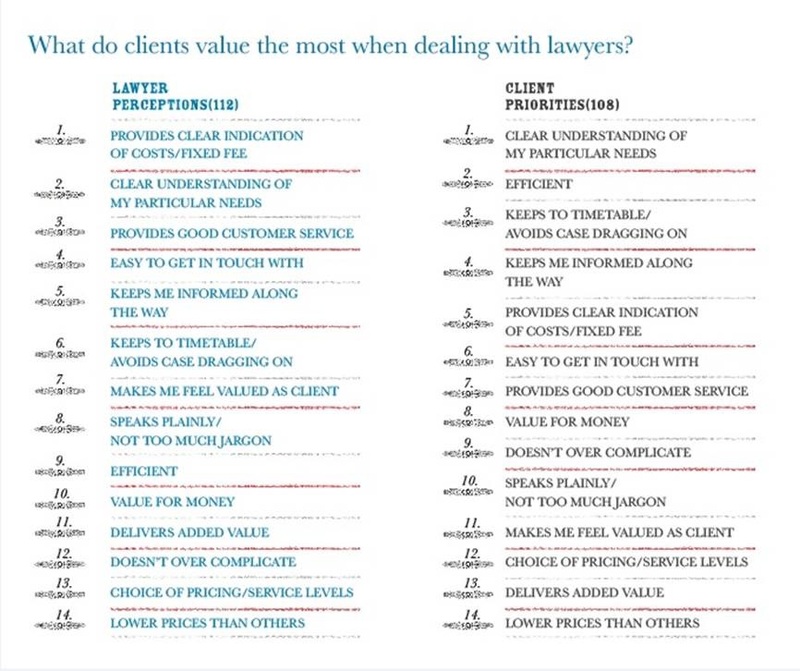 What do clients value most when dealing with their lawyers? Last week I posted on the recent publication of the 2016 LexisNexis Bellwether Report (this year titled ‘The Riddle of Perception’) – with specific reference to the disconnect within the Report between opportunities lawyers identify and approaches they plan to take. Looking at the Report further, when asked: “How do you rate the service given/received in terms of value for money?” – 30 % of lawyers thought they offered “excellent” value for money, whereas only 8% of clients agreed. Probably more worryingly, 46% (almost half!) 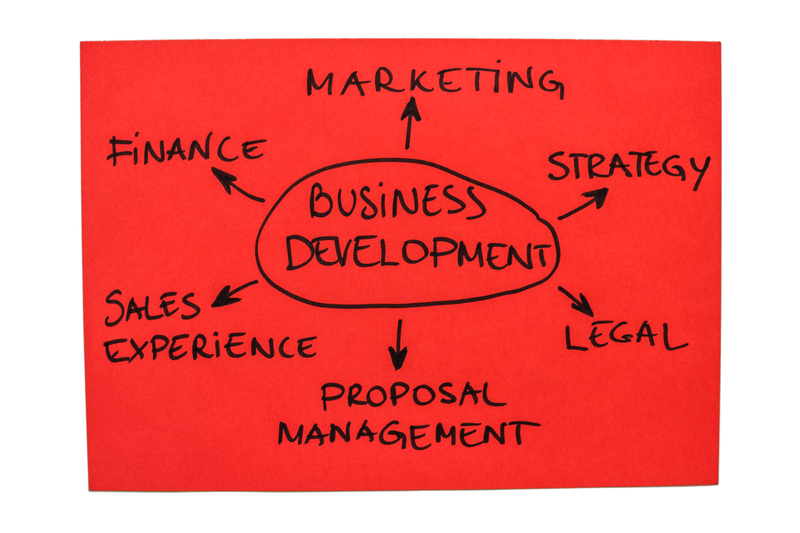 of law firms believed they provided a “very good” service, and only 19% of clients agreed. And of extreme concern to law firms? – 32% (or almost a third!) of clients thought the service provide by law firms was “average“, whereas [not too surprisingly] only 5% of law firms agreed. Clearly a disparity remains between the service that lawyers believe they are providing and those that clients feel they are receiving. And herein lies the problem: as we all know, “value” is subjective, in the eye of the recipient. In other words, it really doesn’t matter what “value” law firms believe they are delivering, but what the client believes they are receiving trumps all. Well, fortunately that question is answered in the Report too. Just because a lawyer agrees to provide a discount doesn’t mean they’re providing greater value! In my spare time, I’m a keen amateur photographer (note, I didn’t say “good” 🙂 ). Anyhow, because of this interest I follow a number of photography related blogs which, every now and then, include posts that crossover into my professional life. Never set yourself at market value – part of knowing what it is you offer helps you better understand what it is you can charge. Don’t base your price purely off of competition. Don’t be afraid to charge more. Value yourself and your work – this is more all-encompassing than a specific tip, but without the confidence and self-value, it’s going to be a much tougher job to set your pricing. Amazingly simple and straightforward advice that many lawyers could benefit from – a fact brought home to me in the very next post in my Ziner app, ‘The deep discount attorney and other cautionary tales‘ by Carala Del Bove on the LexisNexis Business of Law blog. All in all, two excellent posts on understanding the value of the service you provide clients and the dangers you face if you don’t price, bill and collect revenue on your work appropriately. ps – I’d also like to credit Ms Guinn with the title of this post. One of the biggest challenges we face in any professional services organisation is both an understanding of, and an ability to communicate, the value of the service we provide. “I wasn’t very aware of the value of my work until a short while ago. If you asked me about it I would just have said “it’s just a drawing” but now I realise that to get to make that drawing I have invested many years and practice. It wasn’t until people told me not to give everything away for free. Trying to “value my work much more” – getting a better understanding of the overall value my product or service brings to the equation – seems like a good starting point to me.